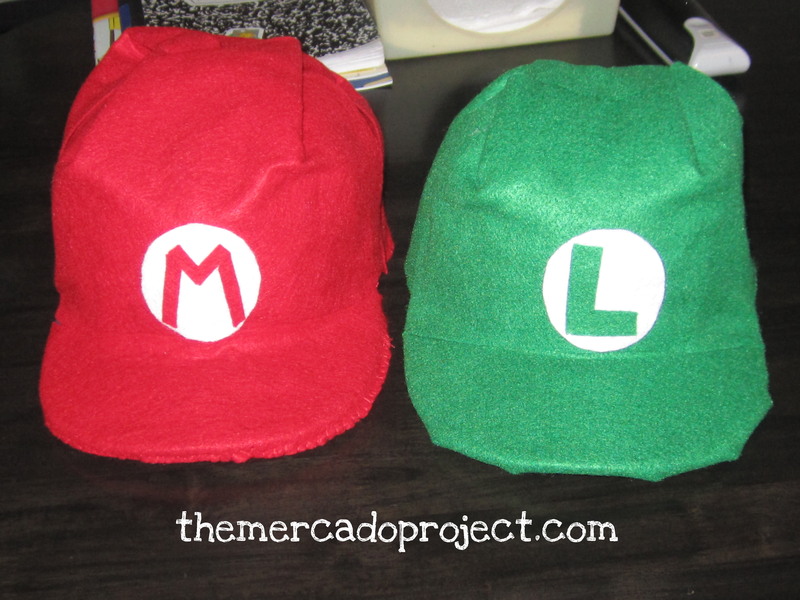 I took hats that we already owned and using felt, tape, glue, safety pins and a sewing needle I transformed them temporarily. 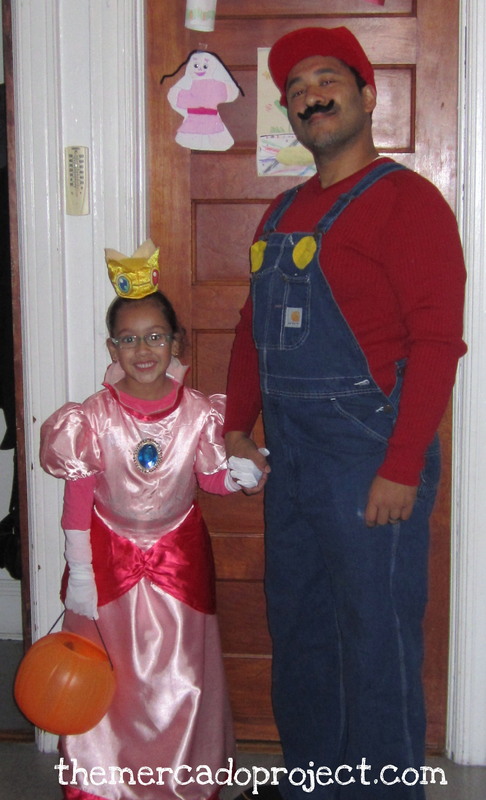 This idea popped into my head the day before Halloween so I had to hustle in order to have them ready for pics and trick or treating, which only my husband did with my oldest ’cause turns out my youngest was running a fever that night and I had to stay home with her. That’s why she was refusing to cooperate. She wasn’t feeling well. 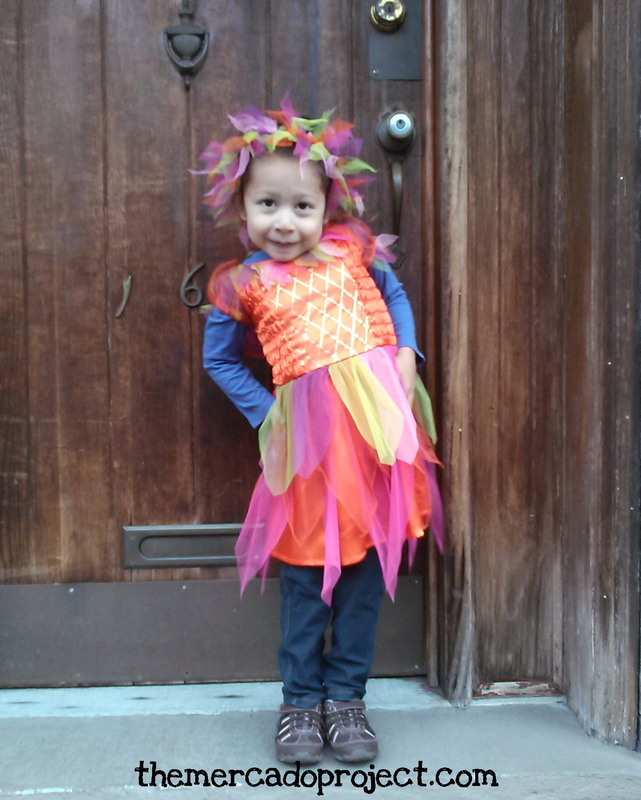 😦 I was able to put a costume on her in the morning when we took her sister to school. At that time she was okay. 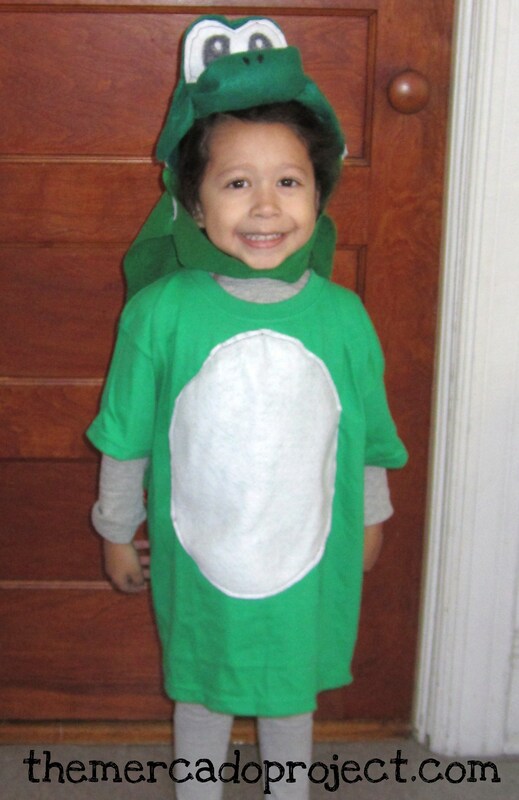 …here’s Sophia in a homemade Yoshi costume. My husband purchased a green t-shirt and felt (white, red, orange, and green) at A.C. Moore craft store. 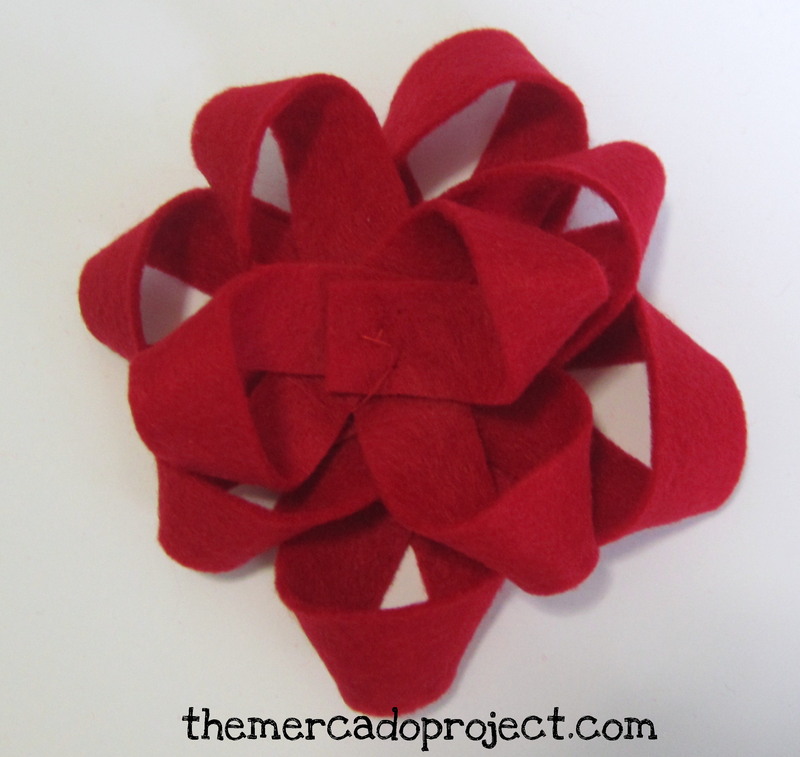 He made the shell using red and white felt and sewed it together. He stuffed it with polyester fiberfill (Sophia can use it later as a small pillow). 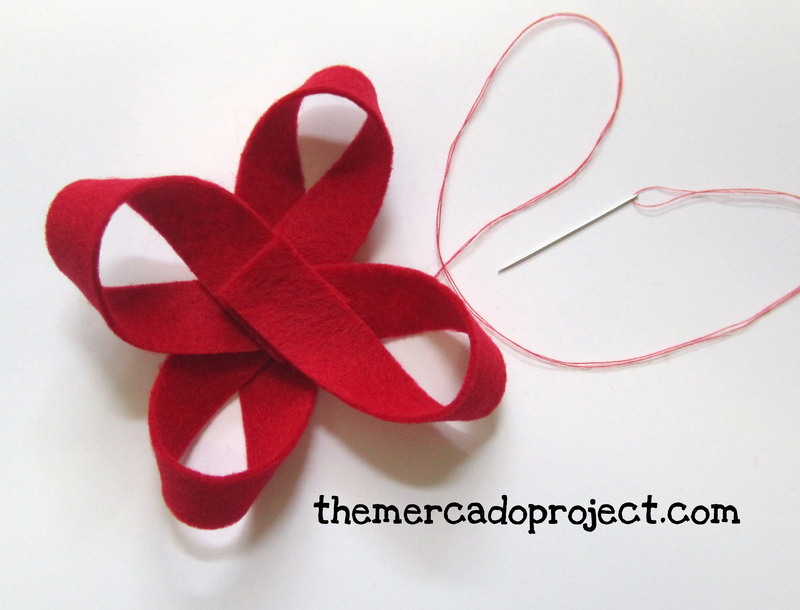 In front of the shirt, he sewed a white felt circle and then attached/sewed the shell in the back of the shirt. 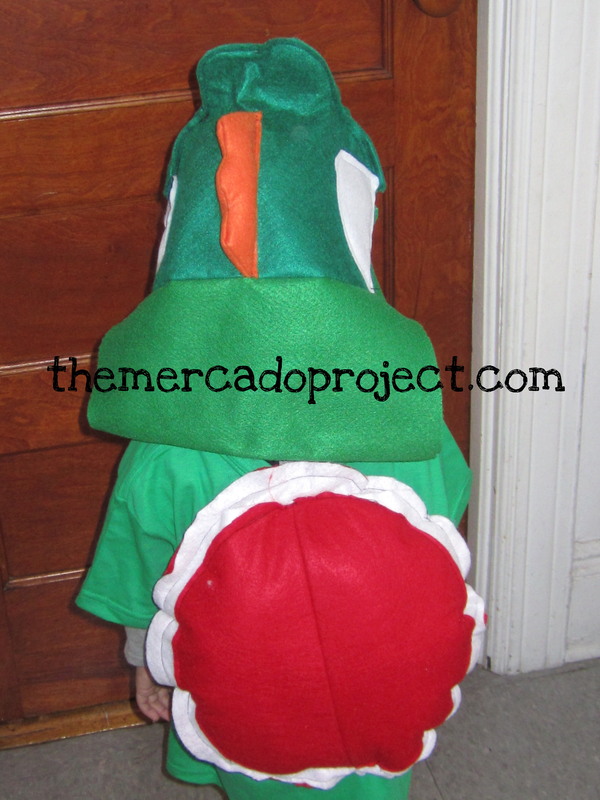 He constructed the head-piece on his own, using green, orange, and white felt. 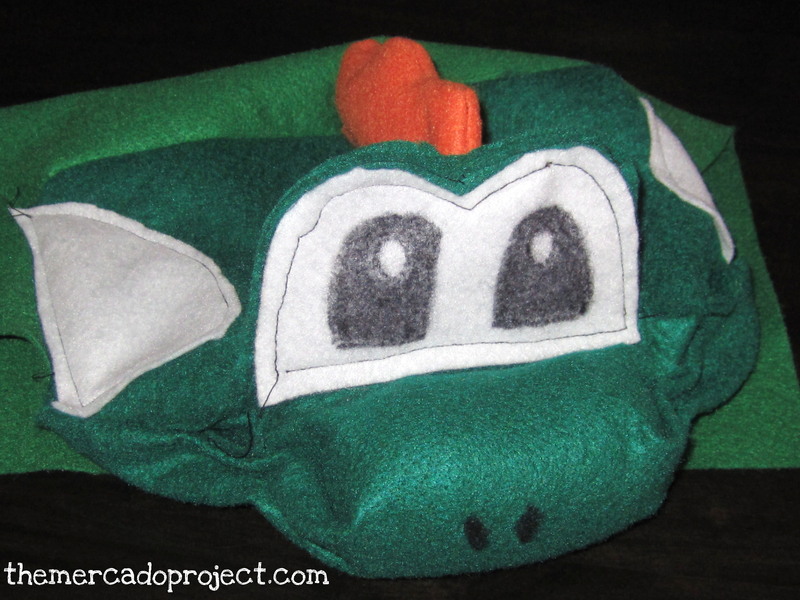 He drew the eyes and nostrils with a sharpie marker and to make the nose prominent he used a little of the fiberfill and sewed it up. 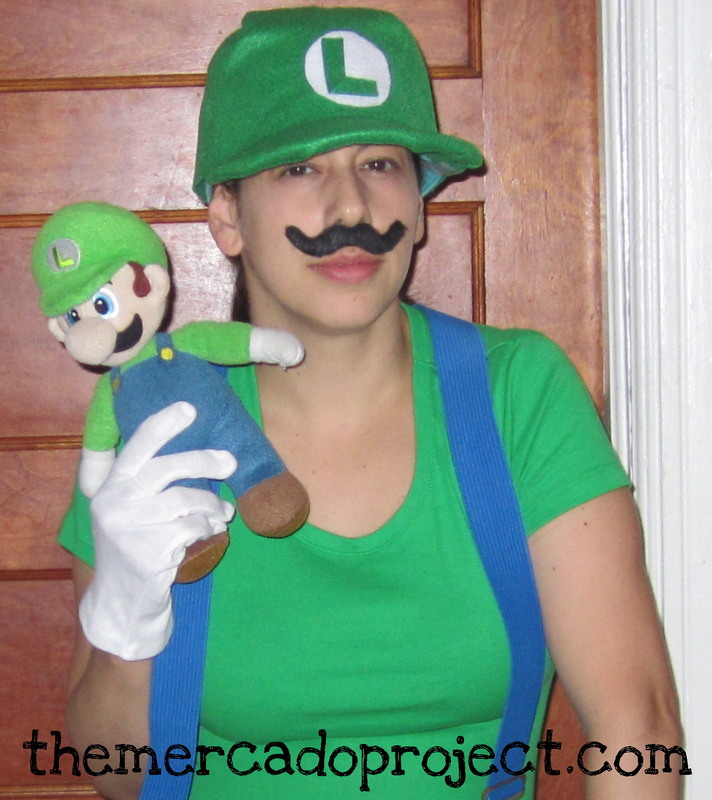 There you go, it’s Yoshi from Super Mario Brothers! I hope your Halloween for 2013 was fun and safe. 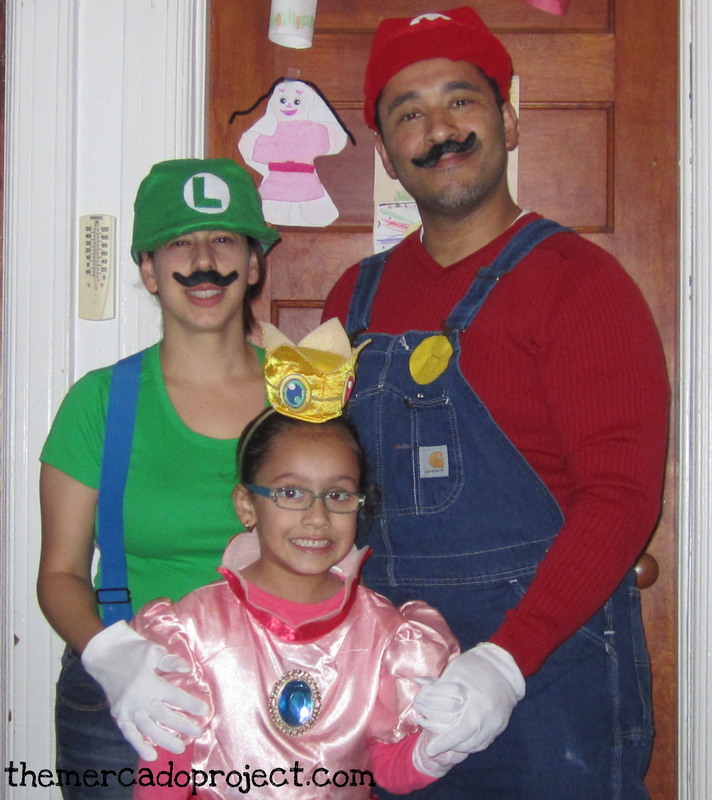 My daughters absolutely LOVE Super Mario and friends. They’re always looking at videos on YouTube and love seeing the cartoon on Netflix. 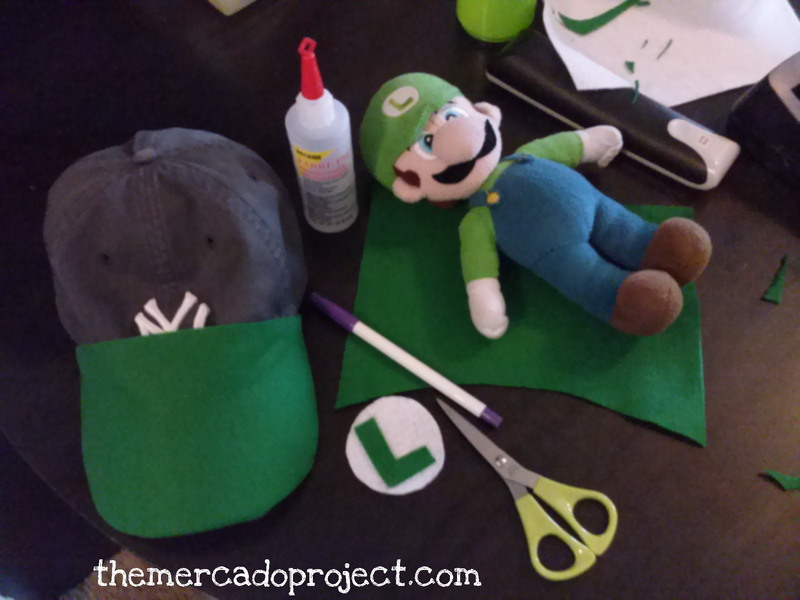 Two weeks ago my oldest found a tutorial video on how to make your own Super Mario star using felt. Inspired by that video, my husband and I decided to make a couple of star buddies for our daughters. 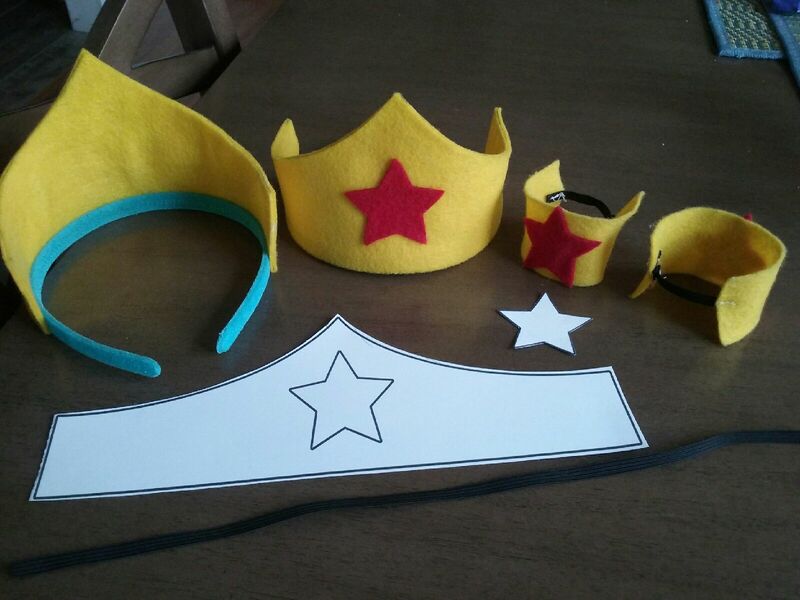 Fortunately, I already had a foam star from my daughter’s birthday decorations, which became a perfect template. 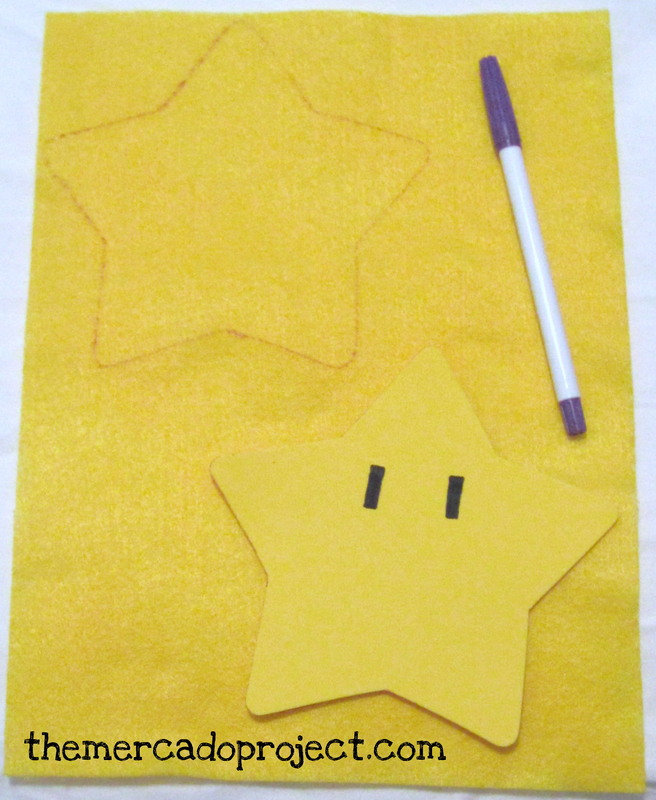 I traced four stars, front and back, on yellow felt with a disappearing ink pen (found in the sewing aisle at the craft store). 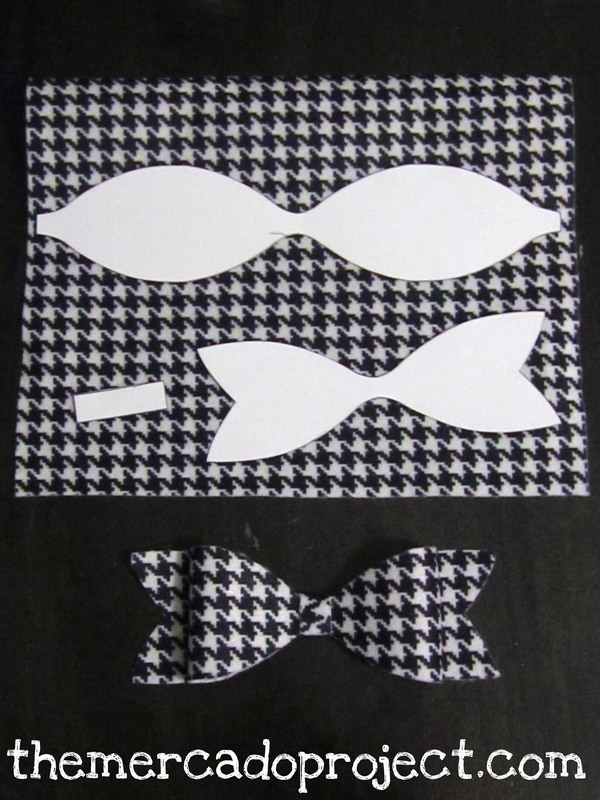 I cut those out along with four little rectangles using black felt for the eyes. That was my job. The sewing part went to my husband who’s better at sewing. We used cotton balls for the stuffing since we didn’t have anything else. Once the stars were done and presented, the squeals that ensued were proof enough that they came out great. Then my daughter declared that she was going to make Bullet Bill. 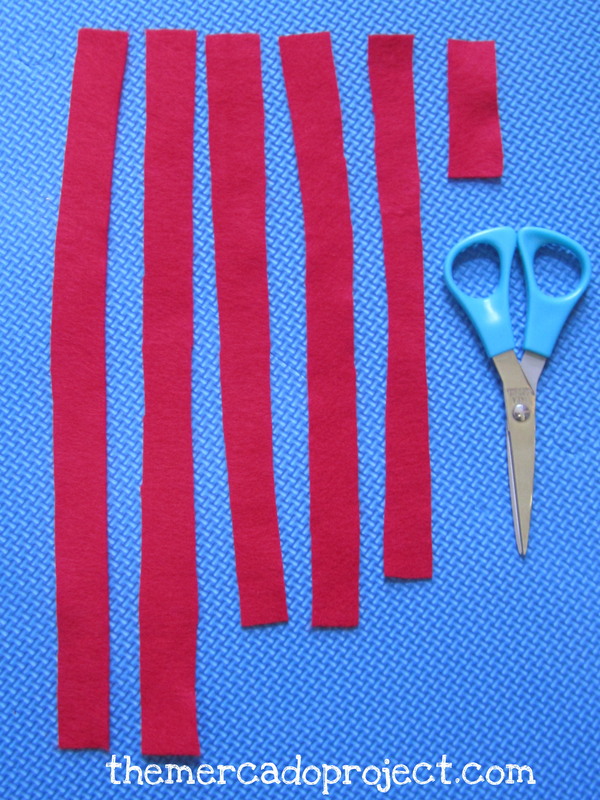 She told me that she needed black, red, and purple felt. And tape! Those aren’t exactly the colors of Bullet Bill, but I indulged her anyway. With her scissors she got to work and asked me if I could cut out two big circles from the red felt and two smaller circles from the purple felt. These circles were going to be the eyes. She tried her very best and taped something up that was supposed to look like Bullet Bill, but wasn’t quite holding up since she used tape. My husband soon stepped in and improvised with what we had in hand (supplies were running low). Without a template, just a picture of Bullet Bill and their creativity, a felt buddy/villain was created. But that wasn’t the end. Oh no, another request, and a trip to the craft store (cotton balls finished), was made several days later. Why stop now? Let’s make one more. 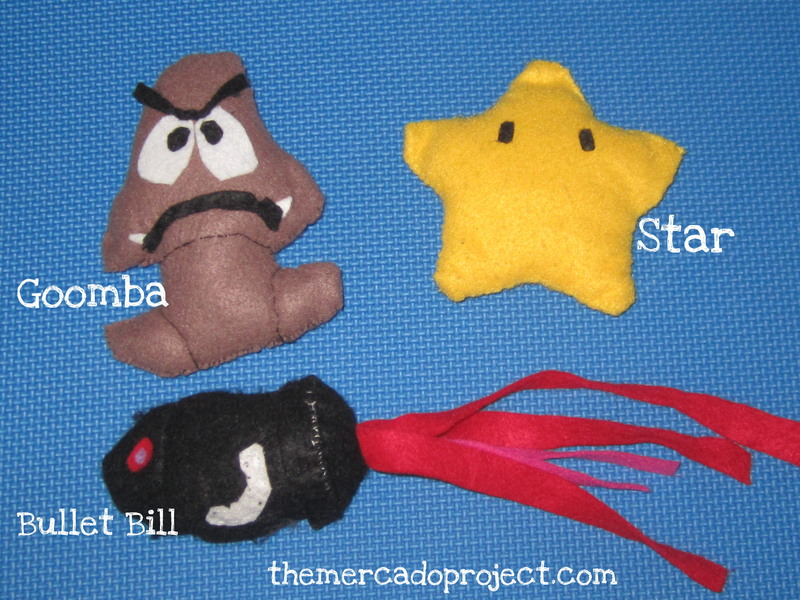 Let’s make Goomba! Again, with the help of a picture of this little villain as well as a sketch template of the body, which my husband did, they got to work and had a lot of fun seeing this little guy come to life, especially with its new stuffing (we purchased a 12 oz. bag of Poly-Fil 100 percent Polyester Fiberfill). 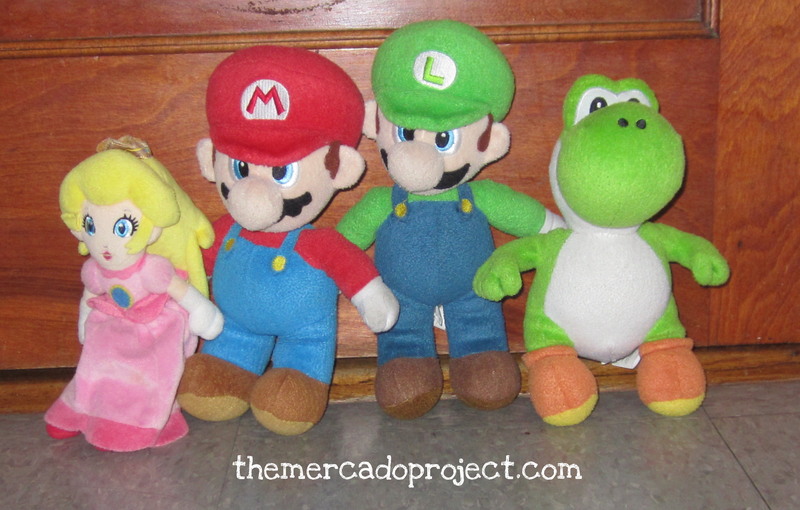 Here are the newest additions (missing a star) to my daughter’s plush Super Mario and friends toys. They absolutely love these guys. As you can see my husband added some red and pink felt streamers to Bullet Bill (not part of the original picture, but creative). I know more characters are going to be requested and we’re going to do our best in bringing them to plush life because it’s a lot of fun. Hello everybody! I hope you guys are well. 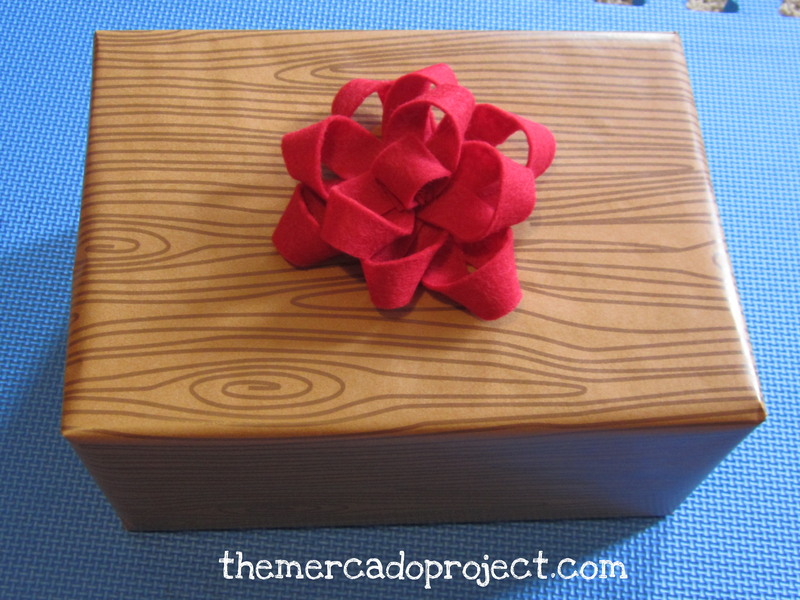 I love wrapping gifts with unique wrapping paper that I either make myself, if the gift is small enough, or find at stores. Recently, I wrapped up this gift for my god-daughter’s birthday. I found this polka dot wrapping paper in the dollar section at Target in Harrisburg, PA awhile back. 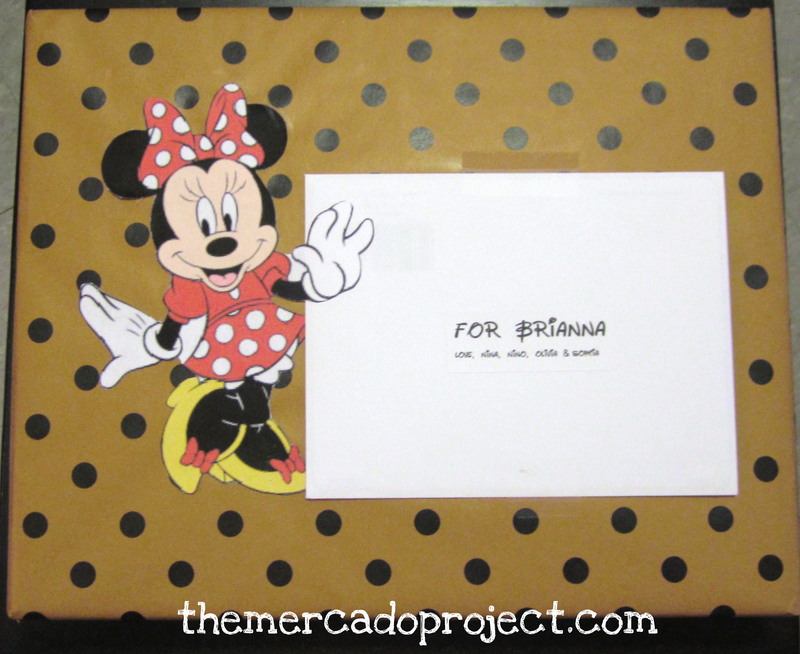 My god-daughter loves Minnie Mouse so I found this clip art and glued it on top and then I found a Disney inspired font and printed out her name on an address label for her card. She’s going to love it! 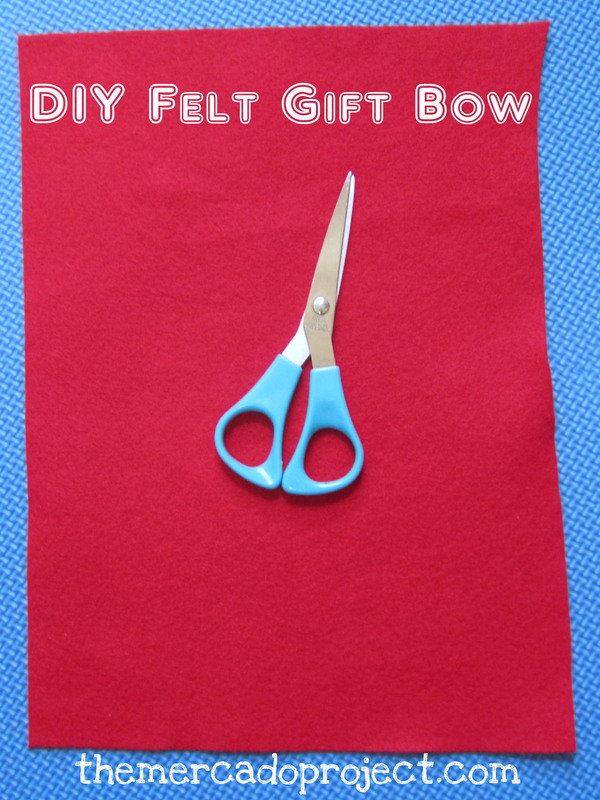 I also love gift bows and after finding that DIY magazine gift bow pin on Pinterest and attempting it with great results, I thought, “Let’s try using something else to make a bow.” HELLO FELT! 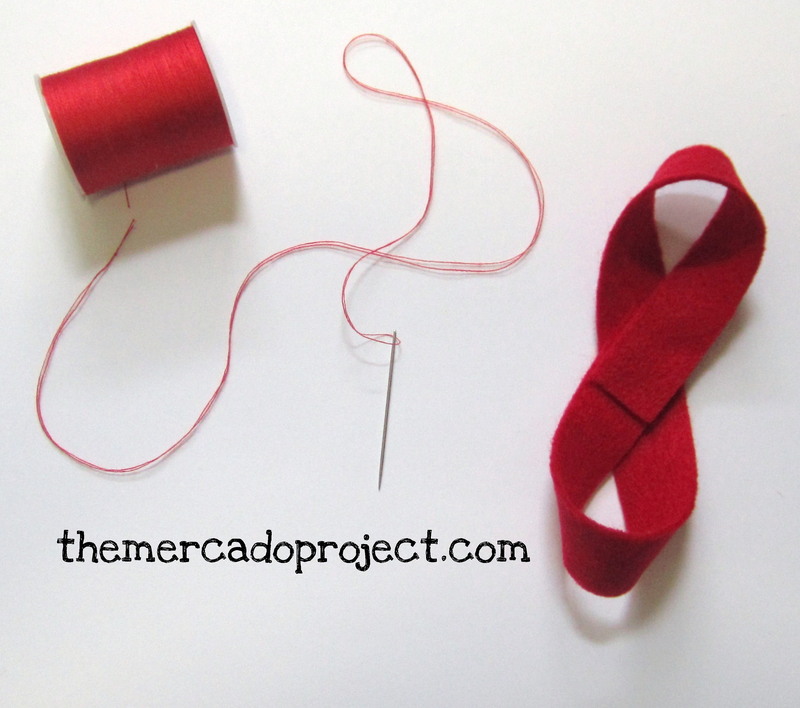 I’m definitely not a pro at sewing, but I do my best. 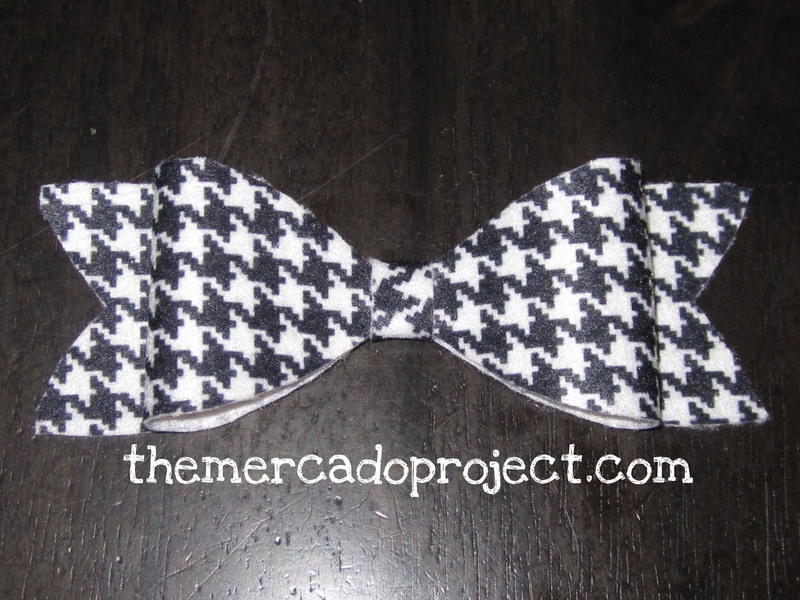 I love the final result of this bow and I used a long piece of thread so I could attach all the felt pieces together without having to cut and start again. 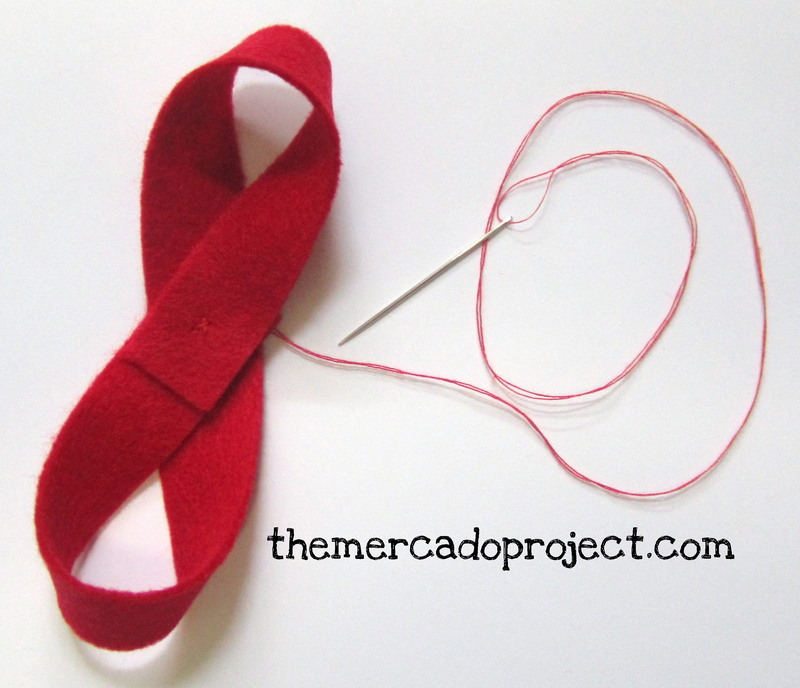 I only cut the thread for the last piece of felt, in which I sewed it separately and then tried to sew it on top of the bow without showing too much thread. I wasn’t that successful, but that was my first attempt and I’m definitely making more of these bows so hopefully practice makes perfect. I’m going to add a little bit of glue so it’ll stay on the gift, but hopefully still come off intact. The gift above is my husband’s Valentine’s Day gift 🙂 wrapped up in another gorgeous print found at Target’s dollar section. I can’t wait to show you what I got him. It’s too freaking cute! 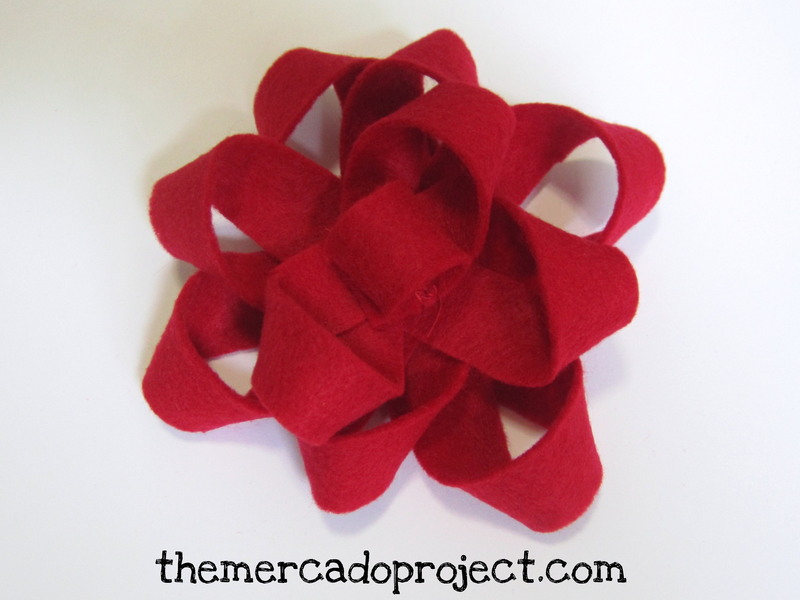 I also can’t wait to do more of these gift bows in different felt colors and designs. 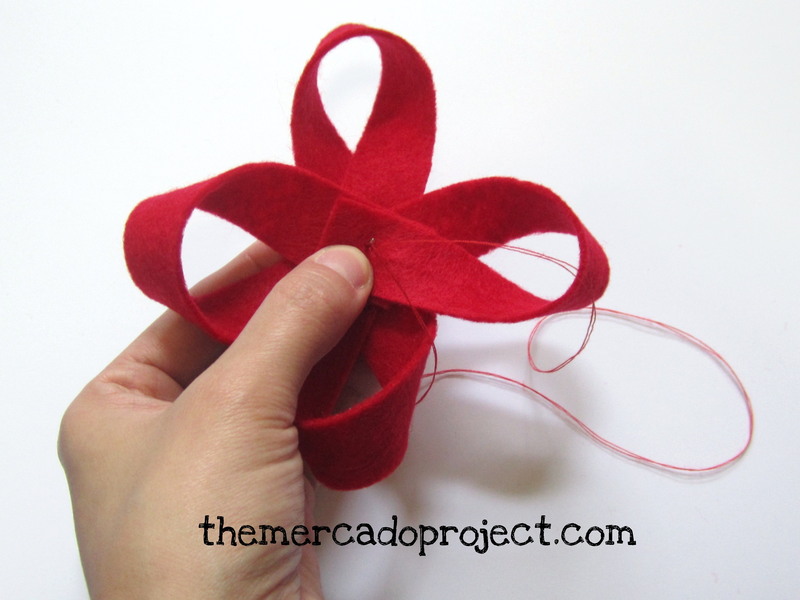 Happy gift wrapping and bow making!